British Paralympian Hannah Russell capped a sensational year after being named in the New Year’s Honours List, writes Andy Fitzsimons. 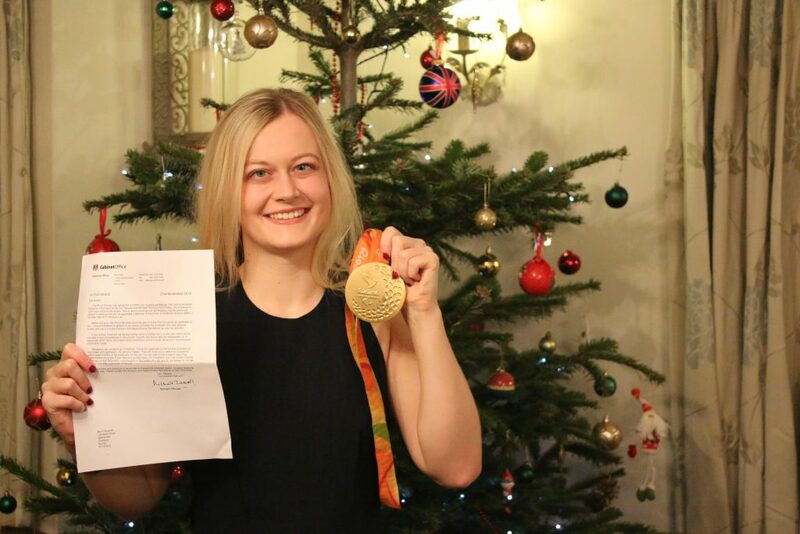 After winning two gold and one bronze medals at summer games in Rio 2016 – and a silver and bronze medal at 2012 Paralympic Games in London – the Woking Swimming Club athlete has now been formally recognised by the State for her services to swimming. Russell, 20, is the latest Woking athlete to become a Member of the Order of the British Empire (MBE). She now joins a growing list of elite Olympic and Paralympic competitors, which have been honoured within her sporting genre. Competing in the S12 (visually impaired) classification field, Russell won a gold medal in the 100m backstroke final in Rio, Brazil, in the world record time of 1:06:06. Speaking with the News and Mail, Russell said that 2016 has been like a dream, which has culminated in both national and international awards, as well a numerous public appearances. She said: “Since returning from Rio in September, the past three months have been unbelievable. It’s such an honour to be recognised by your county for your efforts and successes, but I couldn’t have done it without the support of my family, coaches and friends. “Training for the Paralympic games in Brazil was quite intense for 18 months, but I managed to achieve my dream of standing on top of the podium – twice. Since then, I have visited several schools and given out some awards at a few charity events, which has been great to help me relax and wind down. “I am back studying [at University of Salford] from the end of January, so I now need to re-focus on my training and prepare for the World Championships in Mexico [October 2017]. After several high profile engagements, which included the BBC Sports Personality of the Year award last month, Russell can look forward to another milestone calendar event with her family. The Investiture, which ceremonially recognises those who have been nominated for a national honour, will take place at Buckingham Palace within the next six months. And for Russell, it’s another great excuse to buy a new outfit and to share the lifetime experience with other honorees. Russell will be joined by Joanna Manning-Cooper, who was also nominated for an MBE for her services to sport. Following her extensive and award-winning marketing communications campaign work, which included the London 2016 games, Ms. Manning-Cooper, from West Byfleet, has excelled in her professional field. She now works as the director of digital, marketing and communications for the Rugby Football Union.